Prepare pie crust according to instructions. Alternatively, you can use the pie crust recipe in the video below. It looks tasty. 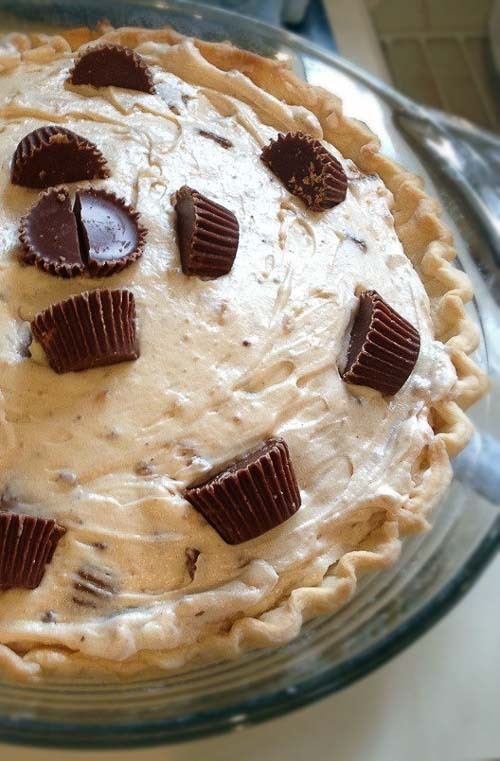 Lastly, keep in mind that only the recipe for the pie filling is used since I made this with a pre-made pie crust. Using a stand mixer and a medium bowl, make peanut butter cream cheese filling by adding cream cheese, 3/4 cup powdered sugar and peanut butter. With the stand mixer's beater scraper, mix until creamy. Using a second bowl, pour heavy whipping cream with 2 tablespoons powdered sugar and vanilla extract. Now, use whisk attachment and whip until fluffy. Make the complete pie filling by combining whipped cream into cream cheese bowl. Manually fold it in using a spatula. It's best to pour whipped cream a little at a time while folding. Continue until filling is creamy, smooth and well-combined. Freeze or refrigerate for 4 hours or until solid enough to your liking. Garnish with mini reese's peanut butter cups while freezing. The filling is from this video. Very easy to follow.